This post is brought to you by Janalyn Voigt, author of DawnSinger. 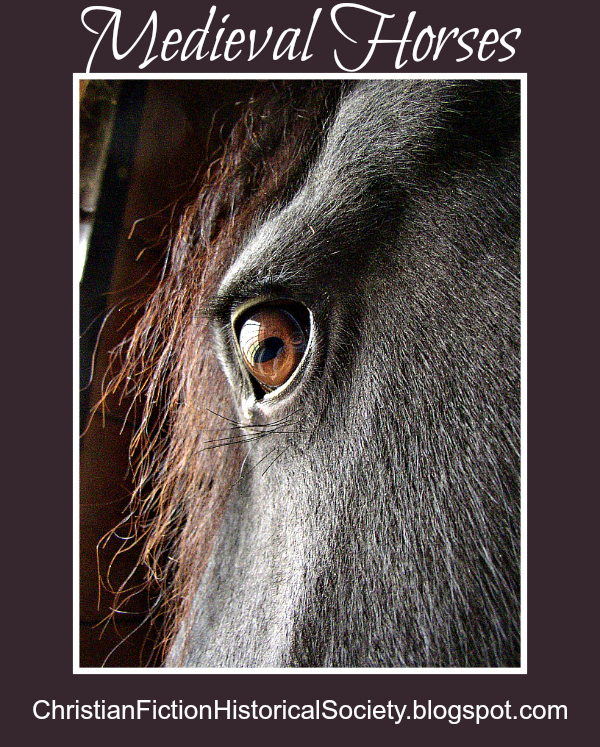 Liquid-eyed creatures with flowing manes that move like poetry itself, horses have long fascinated me. Not surprisingly, equines feature in my medieval fantasy novels. Combining my love of horses with another fascination (flying) produced the winged horses in DawnSinger, book one of my Tales of Faeraven epic fantasy series. Medieval horses were ranked less by breed and more by quality and intended use, with the best reserved for nobility. These powerful horses were usually taller, of a solid color, and highly trained for battle, making owning one a sought-after privilege. Because of their natural aggression, stallions were often used as destriers. Another name for a destrier was a great horse. The horse used in daily activities by knights was shorter and longer than a destrier and valued for its smooth gait. Knights of moderate wealth rode palfreys into battle. Finely-bred mules often ridden by ladies or the clergy were also referred to as palfreys. In the Middle Ages, fast, agile horses with stamina were needed to carry messages and to shorten travel for the nobility. Coursers were not usually well trained, but they were less costly than destriers and palfreys, making them the most common type of horse ridden into battle. The lower classes used rouncy horses for work and riding. These horses were not usually well-bred. Their heaviness gave them endurance to help in the fields, carry loads, and for long journeys. Rouncies were also called Hackneys or Hack Horses. The appearance of the long bow and of gunpowder ushered in a new era in which the medieval war horse went the way of the knight, disappearing forever. Escape into creative worlds of fiction with Janalyn Voigt. I love horses. I had no idea they were looked at differently during Medieval times. Thanks for sharing! My pleasure, Sally. I love horses, too. They weren't so much into isolating breeds as we are now. It was all about the characteristics and purposes of the horse. Thank you for your interesting post. We are horse lovers. We now own five. They are beautiful and mighty animals. They are indeed, Melanie. I'm so glad you enjoyed the post. Thanks for the info - I grew up on a farm, we had horses & mules - but little info about the different breeds, but then - we used the horses mostly for our own entertainment. I've always been somewhat of a klutz - steered a horse under a clothesline when I was a child (my brother, cousin, & I were all dressed up in our cowboy/cowgirl gear, & on horses) - and, of course, I was knocked backwards off the horse, never had much desire to ride after that! My brother was the horseman in the family. 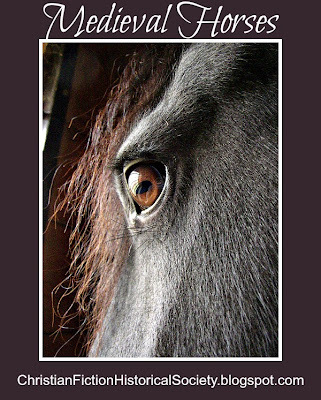 But - I have always admired horses for their strength, grace, & beauty. Were the mules ridden by the women & clergy - considered to be in the same class as the horse? Hello, Bonton. Having learned to ride on half-wild Missouri horses that would brush you off as soon as look at you, I had to smile at your exploit. I'm sorry it discouraged you from riding, though. I doubt mules for women and clergy would have been considered on the same level as horses ridden into battle by knights. Thanks for an interesting post. I've always loved horses and think they are beautiful creatures racing across the fields with manes flying behind. One of my favorite pictures of me as a child is on a pony. I thought I was really something at the age of four. Martha, you and me both. I think I was about four when a photographer took my picture, complete with cowboy hat and cap guns, on the back of a pony. Aw love horses, even though I'm not a horsey person in the sense of riding regularly or knowing them well. That said, I have on one or two occasions heard members of a local Medieval re creationists society talk about their horses or meet them. They seem to have been shorter than some modern types, but indeed there were many varieties. It seems that for a long time horses weren't even used for ploughing and such as they simply weren't strong enough, they used oxen instead. The movies which show people riding about on destriers seem to have it wrong, they weren't intended for day to day riding- and apparently knights didn't gallop when they charged as horses gallop at different paces and this would break the line- or so I heard or read. Thanks for contributing, Bookish. Horses were used to pull carts and do farm work in the Middle Ages. As you mention, oxen were better for ploughing. You're right about destriers. Destriers were too highly trained and expensive to warrent everyday use. That role more often fell to Palfreys. From a practical standpoint, galloping into battle would present all sorts of problems.